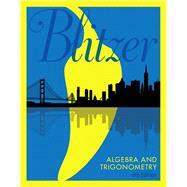 Blitzer’s Algebra and Trigonometry with Integrated Review and Worksheets, 6/e can be used in co-requisite courses, or simply to help students who enter College Algebra without a full understanding of prerequisite skills and concepts. Integrated Review MyLab™ Math courses provide the full suite of supporting resources for the college algebra course, plus additional assignments and study aids from select topics for students who will benefit from remediation. Assignments for the integrated review content are preassigned in MyLab, making it easier than ever to create your course. MyLab™ Math is an online homework, tutorial, and assessment program designed to work with this text to engage students and improve results. Within its structured environment, students practice what they learn, test their understanding, and pursue a personalized study plan that helps them absorb course material and understand difficult concepts. The 6th Edition continues to expand the comprehensive auto-graded exercise options.. In addition, MyLab Math includes new options designed to help students of all levels and majors to stay engaged and succeed in the course. NOTE: This text requires a title-specific MyLab Math access kit . The title-specific access kit provides access to the Blitzer, Algebra and Trigonometry with Integrated Review and Worksheets, 6/e accompanying MyLab course ONLY.